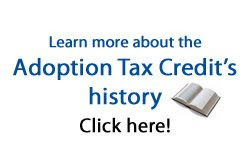 As many adopting families have heard from Adoptive Families magazine and Rainbowkids.com, the federal Adoption Tax Credit that so many families depend on will revert to its original level of $5,000 in December 2010, if its sunset is unopposed. Important legislature has already been introduced to make permanent the current $10,000+ tax credit for adoptive families. The bill presently has 79 sponsors and is in House Committee. With your help this bill can gain the momentum it needs to maintain the federal financial support adopting families count on to adopt both domestically and internationally. Urge both your state senator and representatives to support "The Adoption Tax Relief Guarantee Act of 2009," to make the tax credit permanent. In 2005, a bill with the same intentions – to make permanent the expansion of the federal Adoption Tax Credit as introduced in the Economic Growth and Tax Relief Reconciliation Act of 2001 – went on to gain 74 representative sponsors, but later stalled in the Senate, failing with only 22 senatorial sponsors. Bipartisan support in the Senate will be essential for this 2009 legislation to become law. Click here for a list of current US representative sponsors for this bill. 3) If your representatives have not signed on as a co-sponsor to the bill, send them your request that they do so*. Tell them how important the tax credit was to you when you adopted your children, or how much you and other families you know are counting on the credit to be available in the future. Emphasize that the tax credit truly results in more children finding homes. Tell them that this is so important to you that you will be following the bill's progress through Congress. 4) Include a family photo: While e-mails are valuable, a written note with a picture of your family or your children will be most effective. If sending e-mail, you'll want to avoid attaching a photo; the large size of the message and the attachment could, potentially, mark it as junk or harmful e-mail. 5) If any of your congresspersons are already co-sponsors, write them a thank-you note. Again, letters sent by snail-mail with photos of your children will receive more attention. Click here for sample letters. *Please note that the above recommendations for letter writing were provided by Adoptive Families magazine. This information was provided here in full as the referenced AF article has minor inaccuracies and the 2009 Bill links unintentionally point to the 2005 bill. Thank you for your support of this bill and your heart for finding loving homes for children in need globally! "At a foster home on the outskirts of Beijing, thirteen special needs children are waiting to be adopted," begins Sunday's CNN report, as a CNN correspondent and crew toured Children's Hope International's foster home in Beijing, China. Flipping through a bound journal of pictures and profiles, CHI's Associate Director Melody Zhang recalls each child who has been cared for at the Home of Children's Hope, since 2004, in great detail. They are children representative of the great need for parents who will open their hearts and homes to children with special medical needs or those who are older. The children who live in the foster home now range in age from one month to five-years-old and were born with heart conditions, missing limbs, dwarfism, spina bifida, a cleft palate, or blindness and deafness - medical needs their families could not afford to care for. These children receive healing corrective surgeries and have the opportunity to be adopted domestically or by American or European families. These are huge success stories - as all of these children would not have been available for adoption without their medical care and rehabilitation. Although thirteen children are under our care at our Beijing foster home, Children's Hope places special needs children from throughout China with Children's Hope application families. Since mid-March, 30 children have been matched or placed with families who will care for them and watch them grow into college-bound teenagers and adults with families of their own. Seventy children currently are waiting for their own forever family, on our password protected website. Since 2005, the number of international adoptions from China has slowed. However, Melody reports to CNN, it is not that fewer people want to adopt but there are instead simply more Chinese and foreigners who want to adopt and fewer children up for adoption. This reduction, although it means waits that may grow to 5 years, does not mean families are not needed. It means that there are fewer families that will wait, but hopefully more families whose hearts will open to these special children who desperately need homes. Children's Hope encourages domestic adoption and has been campaigning for the Chinese orphan in both China and the US. The growing economy in China has given more people the means to raise a child, so Chinese parents are less likely to give up their children. "In the past, Chinese people would not consider adopting someone out of the family, but more and more people are educated, and they understand the important part is to raise the child, not necessarily a blood tie," Melody says. In 2008, sixteen children lived in our foster home; four found their forever homes. Beyond those walls, 127 children received corrective surgeries, 8 orphaned children began vocational and technical study, orphans received monthly support from 1148 sponsors, and 6 Tents of Hope served more than 8000 people still suffering in the Sichuan 5.12 earthquake zone. There is certainly need in China. Children's Hope International hopes to siphon the world's love to fill that need, with Homes, Health and Hope so that no child is forgotten. 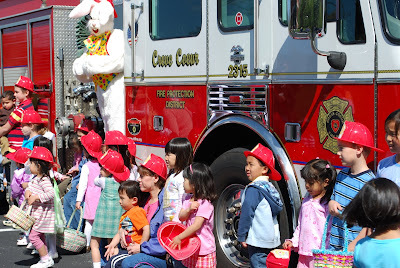 On April 4th, Children's Hope families in the St. Louis region came together to hunt Easter eggs and enjoy a surprise visit by the Creve Coeur Fire Department and, of course, the Easter bunny. Thank you for joining us!